Preheat the oven to 350 degrees F. Line a large roasting pan with foil, and set up a baking rack inside. Set the ham (flat-side-down) on the rack. Score the ham with cuts one inch apart and 1/4 inch deep. Do this in two directions creating a grid pattern over the entire surface of the ham. In a medium bowl, whisk together all of the remaining ingredients for the glaze. Rub half of the glaze over the surface of the ham, and bake for 45 minutes. Pull the ham out of the oven. 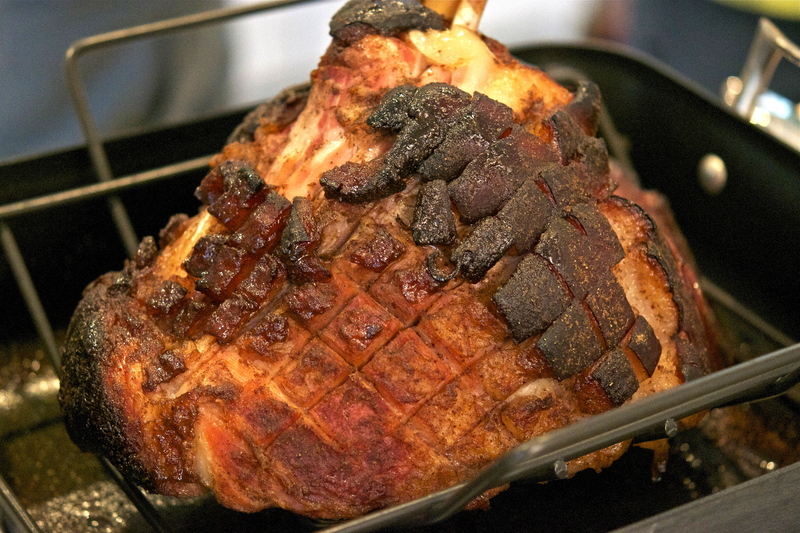 Rub the rest of the glaze over ham and place back in the oven for another 45 to 75 minutes, or until the exterior is dark and crusty and the ham is warmed through.